A well-planted forest garden not only provides nourishment, but also attracts pollinators and creates a wildlife habitat. Read on to learn the basics of planting an edible forest garden. What is a forest garden? A forest garden isn’t exactly a forest, and it isn’t quite an orchard or a vegetable garden. Rather, a forest garden is a planting method that takes advantage of beneficial relationships between plants, much like a woodland ecosystem. The result is a beautiful, highly productive garden that doesn’t require a lot of space. A basic edible forest garden consists of three layers: ground covers, shrubs and trees. 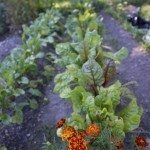 This is a great way to learn how to plant an edible forest garden, but you can also create a more complex forest garden that contains up to seven layers, beginning with edible roots and a ground cover, followed by herbs, shrubs, vines, and both short and tall trees. Roots: A number of easy-to-grow plants fill the bill for this layer, such as potatoes, onions, beetsand garlic. Many experts advise against parsnips or carrots, which disturb the roots of other plants. Some plants, such as wild yam, work as both a root plant and a vine. Ground covers: Low-growing edible forest garden plants help keep weeds in control and provide a great way to utilize areas that would otherwise be unused. Ground covers include edibles like strawberries, clover, comfreyand nasturtiums. Ornamentals such as ajuga, creeping thyme or creeping phlox can be planted as well. Vines: Vines aren’t required and should be used sparingly. 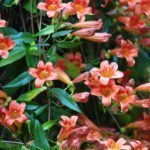 Be careful and avoid plants that may become invasive, like English ivy, Japanese or Chinese wisteria, and many types of honeysuckleand morning glory. Opt for well-behaved, food-producing vines such as kiwi, grapesor hopsinstead. Herbs that tolerate light shade include fennel, chamomile, dillor cilantro. Check the status of the plant in your area, as some herbs may become invasive. Beware of mintor lemon balm, which are nearly always highly aggressive. 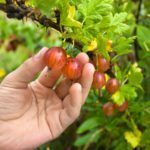 Shrubs: There are dozens of shrubs suitable for planting in an edible forest garden, including blueberries, bayberryand serviceberries. Some shrubs are appropriate for shade while others need at least a few hours of sunlight, so plant accordingly. Short trees: If your forest garden is small, short trees may provide sufficient canopy without planting large or tall trees that take up a lot of space. This layer might include fruit trees, such as peaches, apricotsor nectarines, or nut trees, like almondsor hazelnuts. Again, consider available sunlight. Taller trees: Full-size fruit and/or nut trees also work well for the tallest layer in your forest garden. Consider the mature size of the tree and be careful not to plant too closely or you risk blocking sunlight from reaching the lower layers.